Spacelabs’ AriaTele telemetry transmitter delivers a high performance product with a large full color screen. View your patient’s ECG or SpO2 waveforms from the large easy to read graphic display. Up to four leads of ECG, lead by lead, can be viewed along with the heart rate. Signal quality and battery level icons provide operational peace of mind. 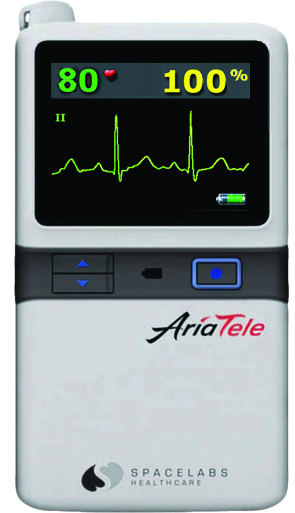 Powered by either standard AA alkaline or eco-conscious NiMH rechargeable batteries and waterproofed to IPX7, AriaTele provides both reliability and a cost effective means of monitoring your ambulatory patients. The slim and lightweight design, coupled with lead wires that are ergonomically placed in a ‘grouper’ set, make it easy to change wires when necessary and channel the cables comfortably through the patient’s clothing. Amber lead fault indicators on the front of the AriaTele immediately indicate a disconnected lead wire or bad electrode contact.